RALEIGH, N.C. - If there had been time, Marie Exley would have liked to start a family. Instead, the 32-year-old Army veteran believes she has less than six months left and she's spreading a stark warning: Judgment Day is almost here. Exley is part of a movement of Christians loosely organized by radio broadcasts and websites and convinced by their reading of the Bible that the end of the world will begin on May 21 this year. 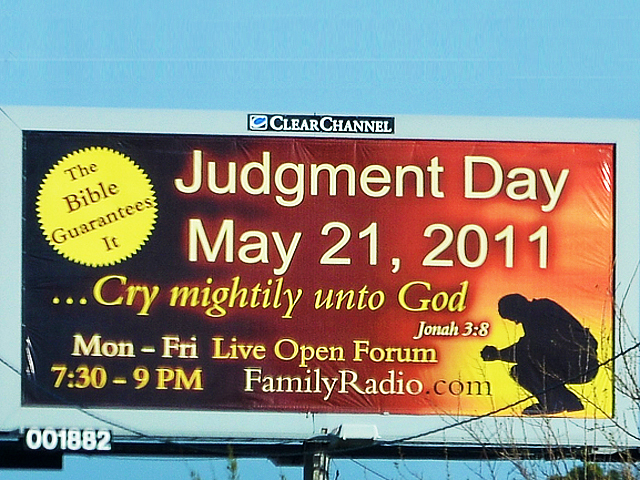 According to literature from Harold Camping and his Oakland-based Family Radio - which calls on the faithful to flee their churches - the beginning of The End is calculated as being 7,000 years from the date of the Great Flood, and both the start of the flood and May 21, 2011 fall on the 17th day of the 2nd month of the Biblical calendar. With the Bible's Revelation 9:5 stating that the "torment" will last five months, Judgment Day is thus marked as October 21, 2011. To get the word out, believers are using billboards and bus stop benches, traveling caravans of RVs and volunteers passing out pamphlets on street corners. Exley says she hopes more people will check the Bible verses themselves. She says: "If you still want to say we're crazy, go ahead. But it doesn't hurt to look into it." In a self-published 1992 book Camping predicted End Time would come in 1994. After followers gathered on the appointed day and did not experience the predicted Rapture, Camping acknowledged that he'd made a mathematical error. Yahoo News group: "Discerning Time & Judgment: May 21 2011"